We’re proud to be a local business and to support other local businesses and organizations here in Austin. There are many well-documented benefits to Austin for each of us choosing to support local, independently owned businesses. We thought we would provide you with a top 10 list of why you should choose local. Improve the Local Economy: Studies have shown that when you buy from an independent, locally owned business, rather than a nationally owned businesses, significantly more of your money is used to make purchases from other local businesses, service providers and farms -- continuing to strengthen the economic base of the community. These studies also show that locally-owned businesses generate a premium in enhanced economic impact to the community and our tax base. Support for Community Groups: Non-profit organizations receive an average 250% more support from smaller business owners than they do from large businesses. No where is this more true than at EcoClean through our PROPs program. Every week we donate 5% of our Wednesday sales to a local non-profit. Keep Austin Weird: Where we shop, where we eat and have fun -- all of it makes Austin home. Our one-of-a-kind businesses are an integral part of the distinctive character of the real Austin. 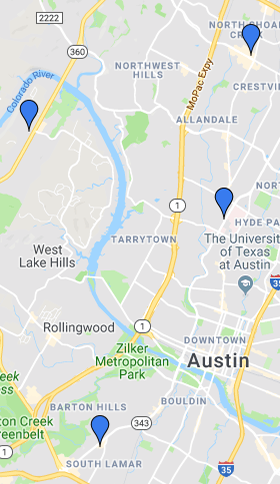 Invest in Community: Local businesses are owned by people who live in Austin, are less likely to leave, and are more invested in Austin’s future.